Seems the best price currently knocking about for this. 6 Year guarantee included. ”A big and beautiful TV with a vibrant picture rich in detail.”– ‘What Hi-Fi’ 2018 award winner. 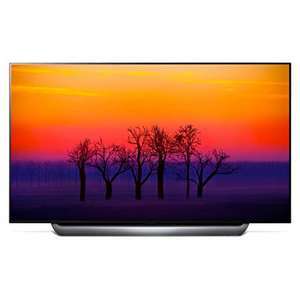 New to this exciting LG TV is the powerful Alpha 9 processor. With increased processing power, Alpha 9 enhances motion handling for smoother images. Object-based contrast is also improved, giving sharper, more detailed images. With Alpha 9 you’ll see images with truer realism than ever. Don’t settle for less. Go for the best, with the LG OLED65C8PLA. I cannot understand how a 65" LG OLED is still 3.5x the price of 65" …I cannot understand how a 65" LG OLED is still 3.5x the price of 65" Samsung UHD LCD This premium, in my view, is too high. It also winds me up like you can’t have an RS6 Avant for less than £50k brand new while A6 Avant 2.0 TDI costs around £35k brand new with passable spec! If you actually own one, you'll see why there is such a difference in cost. Love tv threads, they are hilarious. People really need to get out more instead of arguing over who’s viewing of coronation street is best. Voted hot. Wish I needed a new tv. I cannot understand how a 65" LG OLED is still 3.5x the price of 65" Samsung UHD LCD This premium, in my view, is too high. What 65 inch Samsung is £571.42? I paid £566,39 via a John Lewis price match 2 weeks ago for UE65NU7400, which were Mothers day gifts! The lowest was £524.75, but JL would not price match as this was an internet only deal. These deals have gone now. I monitored over 1 month and started the price match at £699, down to £679 and then £566.39 with a 5 year warranty. I purchased 3 (one for a friend) and should have purchased the full 10 and sold them! I got the 65" Q8 QLED for £1199 from Samsung Experience store last December. I cannot see why this OLED is so much more than the Q8 either. I did view it. I cannot risk OLED due to screen burn due to someone watching the same channel which displays a logo all day. I had burn on my old plasma and saw screen burn on an LG OLED at an exhibition. Channel logos should be banned! I accept most would not see screen burn. I would due to viewing habits. It is without a doubt a stunning very clear picture, but I cannot justify the premium asked. I can afford it, but I do not see the added value to a Q8 QLED at the £1199 I paid. This set, in my view, should cost £1199, just over twice UHD LCD. I compare QLED Q8 at £1199 to this OLED. I think it is a fair comparison. Both have a stunning picture. I compare QLED Q8 at £1199 to this OLED.I think it is a fair comparison. …I compare QLED Q8 at £1199 to this OLED.I think it is a fair comparison. Both have a stunning picture. 3.5x is for the Samsung UE65NU7400 that I purchased as Mother's day giifts from John Lewis. Read carefully. The 65" Q8 QLED was from Samsung Experience store last December for £1199. I still say a OLED should not be 3.5 x more than a UHD LCD. I would expect OLED to be double at the most. I say a QLED should be a similar price to OLED. I hope this is clear. No change in story at all. I got the 65" Q8 QLED for £1199 from Samsung Experience store last …I got the 65" Q8 QLED for £1199 from Samsung Experience store last December.I cannot see why this OLED is so much more than the Q8 either. I did view it.I cannot risk OLED due to screen burn due to someone watching the same channel which displays a logo all day.I had burn on my old plasma and saw screen burn on an LG OLED at an exhibition.Channel logos should be banned! I accept most would not see screen burn. I would due to viewing habits.It is without a doubt a stunning very clear picture, but I cannot justify the premium asked. I can afford it, but I do not see the added value to a Q8 QLED at the £1199 I paid. This set, in my view, should cost £1199, just over twice UHD LCD. Really! Didn’t you spend quite a while on here moaning about that clearance deal only being available in certain stores for a short time required in store ordering and not being available to everyone due to these store locations. You were quite right previously now you’re talking rubbish trying to compare this set to an inferior NU7400. Anyway the C8 was available for £1799 on Black Friday so wouldn’t touch them plus the B8 is only £1500. The C8 is not much of an improvement and most probably wouldn’t see the difference. Really! Didn’t you spend quite a while on here moaning about that c …Really! Didn’t you spend quite a while on here moaning about that clearance deal only being available in certain stores for a short time required in store ordering and not being available to everyone due to these store locations. You were quite right previously now you’re talking rubbish trying to compare this set to an inferior NU7400.Anyway these were cheaper on Black Friday so wouldn’t touch them plus the B8 is only £1500. The C8 is not much of an improvement and most probably wouldn’t see the difference. I am not sure what you refer to. Initially Samsung stores said it was for NHS workers only and finally they were open to all. Hence, I got a QLED. I am not comparing the quality of NU7400 to OLED. There is no comparison. OLED is miles ahead. I just do not believe the level of the premium is justfied, in the same way you do not appear to think the C8 premium is justifed compared to B8. "I cannot understand how a 65" LG OLED is still 3.5x the price of 65" Samsung UHD LCD This premium, in my view, is too high". In my view to an intelligent person this does not mean, "how come 65” OLED can be better than 65” Samsung that’s 3.5x cheaper". I did not use the word better. I simply indicated I believed the premium for the superior OLED was too high. This is the way a sensible person would interpret it. So, I question your reading ability and have every right to. I do not need to listen to you. I have never said QLED is the best. I stated both QLED and OLED are stunning. I really think, you have problems with your reading ability. Note: In case you did not understand, the NE65NU7400 is a UHD LCD television. I do question your reading skills and do so again. I stated in a post that …I do question your reading skills and do so again. I stated in a post that has not bee edited:"I cannot understand how a 65" LG OLED is still 3.5x the price of 65" Samsung UHD LCD This premium, in my view, is too high".In my view to an intelligent person this does not mean, "how come 65” OLED can be better than 65” Samsung that’s 3.5x cheaper".I did not use the word better. I simply indicated I believed the premium for the superior OLED was too high. This is the way a sensible person would interpret it.So, I question your reading ability and have every right to. I do not need to listen to you.I have never said QLED is the best. I stated both QLED and OLED are stunning.I really think, you have problems with your reading ability.Note: In case you did not understand, the NE65NU7400 is a UHD LCD television. Like I have said, vote hot (as this is best deal for this TV!) and move on! Your mind is made up and you got yourself Q8 - enjoy! I for one, don’t care what your thoughts are about this OLED costing more than Q8! I just want you to have a look at this article and believe what you want to believe. I am not against any OLED or QLED TVs. I just came across this article and wanted to share it with you. Like I have said, vote hot (as this is best deal for this TV!) and move …Like I have said, vote hot (as this is best deal for this TV!) and move on!Go and find yourself a forum to post your intelligent insights about TVs attracting premium prices and your feelings about that...Your mind is made up and you got yourself Q8 - enjoy!I for one, don’t care what your thoughts are about this OLED costing more than Q8!Bye! It's a bug that's being patched. No real story here. I have been living with a Pioneer Kuro plasma for some years, arguably about as good as you could get with picture quality - and cost me loads some years back. Whilst visiting friends and family, I always noticed how poor the quality of most other tvs were and when others visited us, there were frequently comments about the quality of picture on the Pioneer. My family are pause addicts and the tv is probably paused for more time than being watched and when I bought it there was a media frenzy about retention/burn to plasma displays. I have never noticed any retention whatsoever, let alone burn so not going to panic unnecessarily. Bought the 65C8 on Black Friday for £1999 as someone kindly posted a £400 off voucher so I was a happy chappy. The tv has settled in now and I have to say that the picture is stunning! Even my wife comments about how realistic things look - even some non 4k stuff. 4k discs are fantastic!! Again, when visiting friends and family, nothing I have seen compares whatsoever and lots are new tvs. Visitors to us always comment on the picture quality and ask how much and where they can get one. I can't comment on the QLED vs OLED as haven't seen the QLED running for long but I can't imagine any picture better than this. I have been living with a Pioneer Kuro plasma for some years, arguably …I have been living with a Pioneer Kuro plasma for some years, arguably about as good as you could get with picture quality - and cost me loads some years back.Whilst visiting friends and family, I always noticed how poor the quality of most other tvs were and when others visited us, there were frequently comments about the quality of picture on the Pioneer.My family are pause addicts and the tv is probably paused for more time than being watched and when I bought it there was a media frenzy about retention/burn to plasma displays.I have never noticed any retention whatsoever, let alone burn so not going to panic unnecessarily.Bought the 65C8 on Black Friday for £1999 as someone kindly posted a £400 off voucher so I was a happy chappy.The tv has settled in now and I have to say that the picture is stunning! Even my wife comments about how realistic things look - even some non 4k stuff. 4k discs are fantastic! !Again, when visiting friends and family, nothing I have seen compares whatsoever and lots are new tvs. Visitors to us always comment on the picture quality and ask how much and where they can get one.I can't comment on the QLED vs OLED as haven't seen the QLED running for long but I can't imagine any picture better than this. The main difference is QLED is very bright, and the colours are stunning.Much higher nits than OLED. I watch with lights on. Both OLED and QLED are simply stunning displays. I am not accepting anything you are saying regarding OLED TVs! There is an ignore setting? Can I go to your profile and make all your future comments disappear from my HUKD app entirely? Shame something pushes you to come here and comment on OLED threads where clearly you have already committed to QLED and happy with it! You won’t see me coming to QLED threads and bashing the technology or price vs OLED vs Quality! As a matter of fact, I have voted HOT loads of QLED deals if the price was right! I presume you have voted this deal HOT (as it is!) and you are just one of those people that likes to be heard and voice his opinions regardless of whether anyone’s interested in the slightest? As I very much doubt people coming here for OLED deals would be! Suddenly that ‘ignore user comments’ setting sounds like a blessing with regards to your person! Where is it again? I paid £566,39 via a John Lewis price match 2 weeks ago for UE65NU7400, …I paid £566,39 via a John Lewis price match 2 weeks ago for UE65NU7400, which were Mothers day gifts!The lowest was £524.75, but JL would not price match as this was an internet only deal.These deals have gone now. I monitored over 1 month and started the price match at £699, down to £679 and then £566.39 with a 5 year warranty. I purchased 3 (one for a friend) and should have purchased the full 10 and sold them! LOL Richer Sounds would not price match down to £1,999 for me last weekend, so bought one from John Lewis who accepted a price match. RS’s loss I guess. And on that note, have a nice day and try not to reply anymore as I think you have clearly demonstrated with your first comment your understanding of OLED technology over UHD LCD and the idea of ‘premium’. Hasn't this been £1500~ recently... Costco perhaps? Pretty sure that was (perhaps still is) the B8 not the C8. Both cracking TV's there are a good few comparison videos knocking around to help you decide whether the C8 is worth the extra £500 . Probably because the picture quality is 3.5x better? better then that actually. Own one of these and the image is probably one of the best on the consumer market. 4k content is typically only available on Netflix and iplayer as far as I am aware. Non the less its quality. Own one of these and the image is probably one of the best on the consumer …Own one of these and the image is probably one of the best on the consumer market. 4k content is typically only available on Netflix and iplayer as far as I am aware. Non the less its quality. Why is there such a difference in cost between this and the 2018 Samsung QLED flagship QLED Q8 which was £1199 (but a lot more now)? I do not see it and I am think you would not either, if you actually owned a Q8. I think they are as good as each other. Both have pros and cons, but equivalent. If the Q8 65" was always £1199 I think 65" OLED would be dead if priced at £1999! The difference would have little justification. £1199 was hot deal for a Q8. It may never be repeated. £1999, I do not think is "hot". This is my view and you are entitled to disagree. OLED and QLED are both stunning displays. Would C8 justify the £500 over the B8?